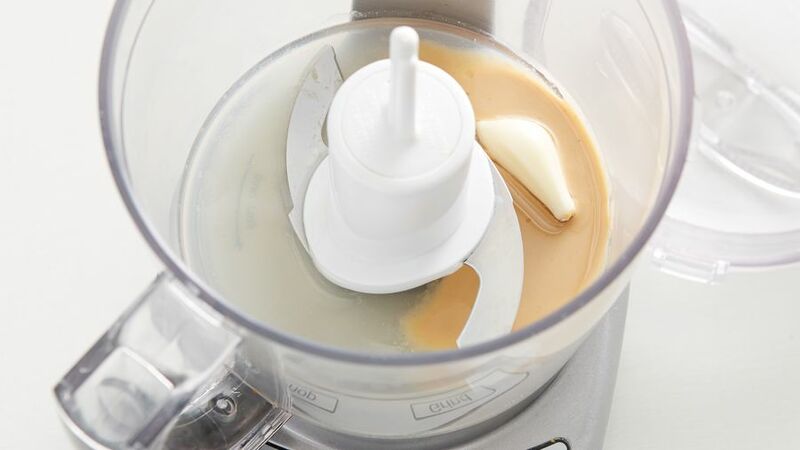 Put the tahini, lemon juice, water, salt and pepper in the blender. Process until smooth, adding the garlic clove while the blender is on. Make sure there are no large chunks of garlic left. Pour the dressing over the salad right before serving, and stir with two large spoons. If you can't find baby kale, use regular kale instead (Tuscan, curly or any other). Remove the hard stalks, and tear the leaves into smaller pieces. 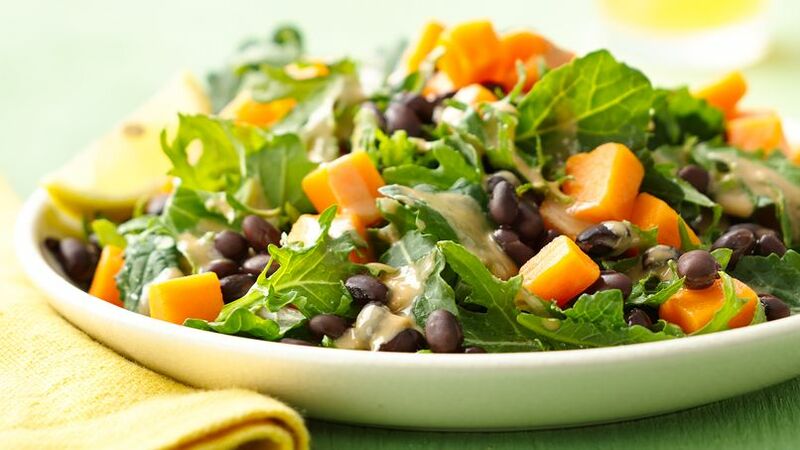 A great way to give a twist to this salad is by using hummus instead of tahini when making the dressing. Hummus has tahini as part of its ingredients, but it also has chickpeas and other spices, which will bring new layers of flavor to this salad. Sprinkle the salad with sesame seeds (tahini is sesame seed paste), or with other seeds such as pumpkin or sunflower for greater texture. Morena Escardo Kale is the leafy green of the moment. Wherever you turn there is kale added to salads, juices or hot dishes, and enthusiasts talking about its possible benefits for health. In Latin America, we are not well acquainted with this robust veggie, and I have to confess that even though I’ve been a vegetarian all my life, I didn’t try it until a few years ago. An even bigger confession is that I wasn't greatly impressed by its taste at first, and it took some months -and many kale leaves in between- for my taste buds to warm up to its assertive, grassy flavor. It really wasn’t until I discovered baby kale, that I fell head over heels for it, and this dark green leaf became my go-to salad base. I now use kale for everything, and there's always a box of baby kale in my fridge. 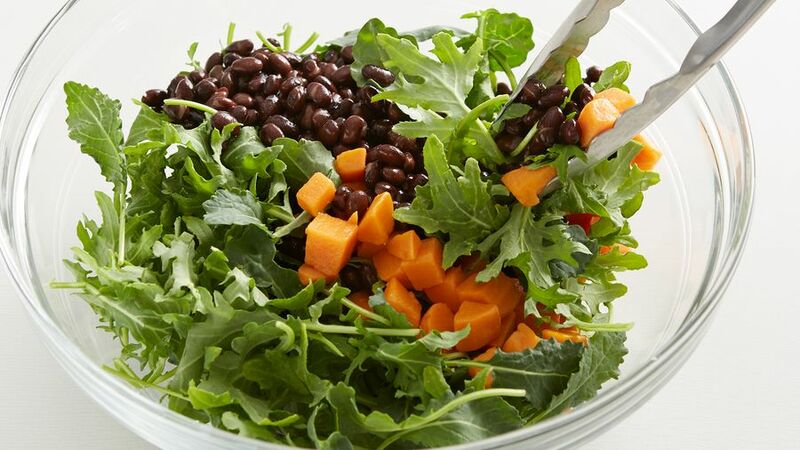 This kale, black bean and sweet potato salad is one of my favorite ways of eating it, as it brings in some Latin elements that not only add great taste to the dish and give me comfort, but they also make this a very satisfying salad that fills me up with energy.